The PDMP monitors dispensed drugs that contain controlled dangerous substances (CDS). The goal of the PDMP is to assist medical, pharmacy, and public health professionals in the identification and prevention of prescription drug abuse. It also promotes a balanced use of prescription data that preserves the professional practice of healthcare providers and legitimate access to optimal pharmaceutical care. Click the Maryland PDMP logo to begin your registration! Click here to retrieve your PDMP Registration Confirmation Code! 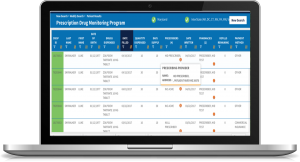 CRISP serves as the access point for clinical providers, including prescribers, pharmacists, and other licensed healthcare practitioners for viewing filled CDS prescriptions. All policies on access are regulated by MDH. If you have access to Maryland PDMP data, you can also view PDMP data from D.C., Virginia, West Virginia, Pennsylvania, Connecticut, Delaware, Minnesota, and Arkansas.